Once again Adriano reveals another little known work and leads us up a rocky mountain path to reveal Brun�s grandiose Symphony No. 3 in D minor. The path is rocky making demands on the listener and it is probably only after repeated hearings that Brun�s grand design will be fully appreciated. The first movement�s music is densely scored for a large orchestra; and there are brief stretches of atonality and dissonance that may seem daunting at a first hearing. It is not only the physical dimensions of the hostile high mountain environment that concern Brun but also the metaphysical - the struggle, akin to that in Franck�s Symphony, of escaping from darkness to light. The music is strongly influenced by Brahms, Bruckner and Sibelius. The very earnest opening movement that expresses all these evocations and sentiments does have lighter moments, though - expressive of the natural life on the lower Alpine pastures. The second movement is in the form of �Variations on an old Swiss-Italian Epiphany carol� (�We Are The Three Kings�) and again the shadow of Brahms looms large. The opening mood, as the theme and the first variation, Tranquillo, are stated, is solemn. The second variation is slightly lighter in hue and somewhat pastoral but then comes an extraordinary variation, Alla Marcia that is reminiscent of Korngold in Robin Hood mode before the music turns virile Brahmsian. The next variation, Presto, is reminiscent of the Walpurgis section of Berlioz�s Queen Mab. Variation V is more tender, a plaintive Bach-like aria with an overlay of Berlioz while the final variation, commencing affectingly with a duet for two cellos, may remind one of Marguerite�s music from La Damnation de Faust. These two last variations impress strongly. The material of the final movement bears strong relationships to that of the first movement. Here a benign Brahmsian influence in lyrical and folk mode is predominant. 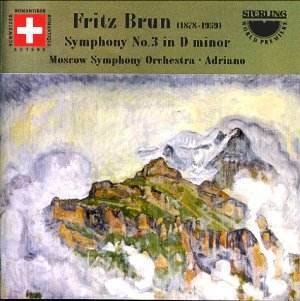 Brun is up in the Alpine slopes singing his praise of nature � the music showing a welcome light-heartedness (in places it is almost boisterous) after the heavy introspection of the opening movement. Only an occasional passing cloud mars the sunshine. Adriano makes an eloquent and passionate case for this rather solemn epic symphony. Adventurous, persevering listeners will discover riches.